For my Adobe Creative Residency project, I’m working on considering how we might consider and design and equitable, human-centered future. 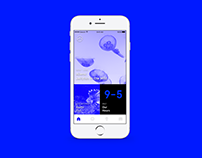 For some background, I’m an interaction designer with a personal interest in ethics, philosophy, and technology. When I was initially thinking about what it was I wanted to accomplish in my time with the Residency, I kept coming back to my interest in the intersections of these spaces. I wondered what a year-long solo project with this backbone of interdisciplinary fusion might look like- and configured my Residency around the large, open-ended, ever-present question: how might we make and design future technologies more equitable and human-centered? I’m pursuing answering this question within multiple areas that I’m passionate about, all while focusing on how I can make my creative process feel ownable and personal. The space I’ve been working in within the past three months is professional networking- I’ve been thinking on solutions that make professional networking feel more meaningful, sustainable, and personal. The above video shows a quick summary of the work I’ve been pursuing these past 3 months, from research to deliverable. My overall process starts with secondary research and primary research, which turn into insight and principle generation, which form the backbone of my brainstorming and prototyping phase. These brainstorms and prototypes are tested and worked on, and these revised pieces eventually help make a final deliverable. It might sound strange, but I think my current favorite part of my design process is doing research. Thorough, dedicated research is so critical in designing something- even a prototype not intended to become entirely real. For this project, I started by research the current scope of products in career services, issues in receiving and finding jobs, and articles describing the space. 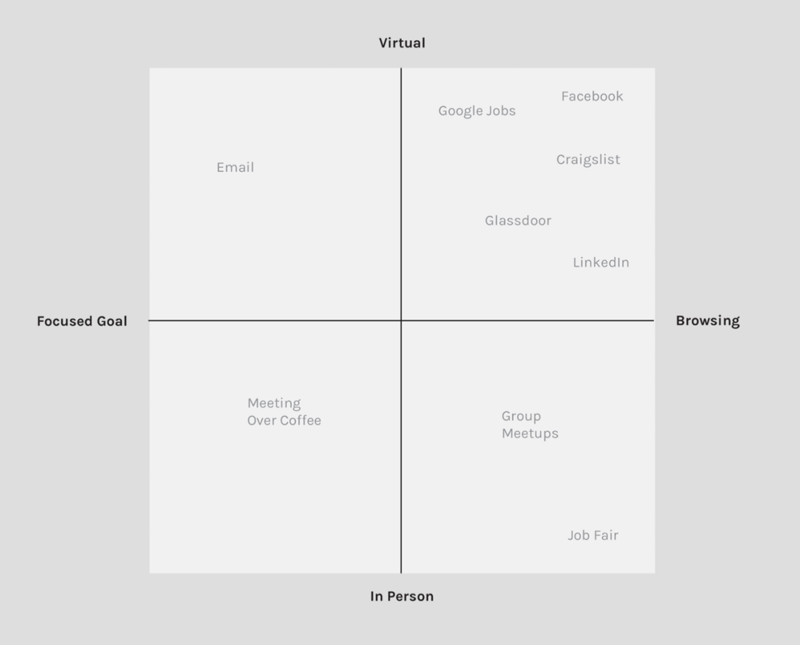 I found that many products gave users opportunities to virtually see and apply for many jobs, but few gave opportunities for users to meet professionals or interact with anyone 1-on-1. This troubled me, as I found in a Glassdoor report on jobs that, on average, for every 1 job open there are 250 applicants. The current services make finding a job stressful, impersonal, and difficult to actually find and receive jobs. Much of my secondary research findings led me to the idea that finding meaningful jobs isn’t about how many jobs you apply to- it’s about the personal connections you make with people in your field. With that idea in mind, I wanted to frame my primary research within an audience currently dealing with the issues I’ve described: millennials. 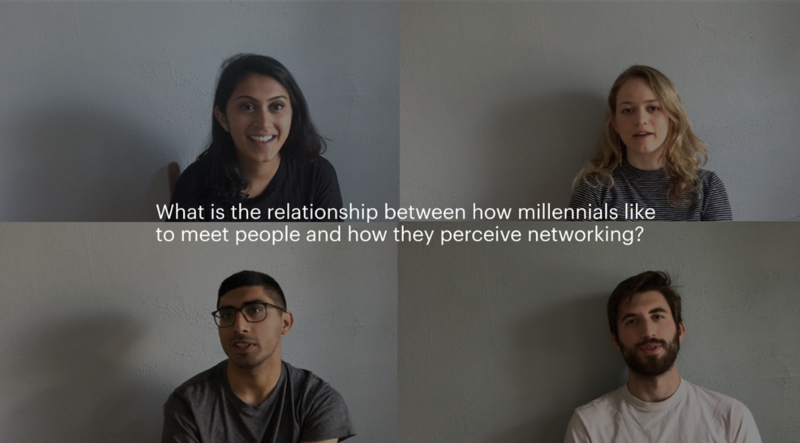 I interviewed 6 millennials about their past job experiences, how they like to meet people, and what stresses them out about finding work. These interviews each took around 45 minutes to an hour, and gave me terrific insights into problems facing millennials getting employed at workplaces they felt aligned with their values and interests. I also had each interviewee participate in a research activity called the circle of trust. In the activity, participants rank how uncomfortable to comfortable they are with certain ideas by placing cards with professional networking behaviors from close (comfortable) to far (uncomfortable) from them. 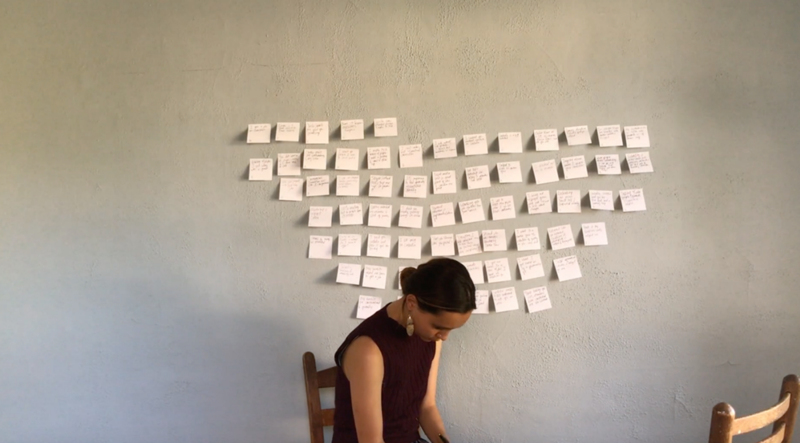 My general process for finding insights after interviews is simple yet effective: I write down everything my interviewees said on post it notes (labeled with a number representing who said what) and places those post-its on a (big) wall. After getting all of the notes up on the wall, I start to cluster post-its together that have similar statements, or stories that have similar trends running through them. The more time I spend with the notes, the easier it becomes to identify patterns. I then write down those patterns, and those patterns start to get clustered. Eventually, all of this clustering of patterns turns into meaningful insights from my interviewees. ⁃ Job boards feel unlikely to actually foster getting a job. ⁃ Most every job was received by having a connection or meeting in person. ⁃ Casual interactions in meeting places like coffee shops feel less overwhelming. ⁃ “Networking” events feel forced and overwhelmingly large. ⁃ Getting an introduction is most comfortable when meeting a new professional. ⁃ Job boards have so many jobs it is difficult to discern which are trustworthy. ⁃ Recruiters feel like automated robots. ⁃ Talking to a professional is most comfortable 1 on. ⁃ Linkedin is used almost solely for messaging or finding mutual connections- not for it’s news feed or job posts. ⁃ Meeting in person trumps meeting over Skype or over the phone and those connections are lasting. ⁃ Networking has a negative connotation of being superficial. These insights then turned into general principles for the solution I made. Making principles is important, and different from finding insights. While finding insights is all about learning about habits, motivations, goals, fears, etc. from people, generating principles is all about how you’ll take those learnings and make sure they apply to the service you come up with. ⁃ My solution should promote one on one, in-person conversation. ⁃ My solution should make all interactions feel personal and organic. ⁃ My solution will not attempt to do all things- it will primarily help connect people to have conversation in the first place. Brainstorming is another part of my process that I love dedicating time to. My brainstorming usually deals with rapid ideation and drawing-both of which usually look like chicken scratch but are incredibly formative in making a holistic solution. For this part of my networking piece, I used a brainstorming technique where I set a timer and give myself 5 minutes to draw out 10+ ideas. A piece of advice in brainstorming: constraints help! Give yourself a time limit, an area of focus, a technology to ideate on: you’ll really help yourself generate ideas quicker! I did this activity a few times, and started finding ideas within the brainstorms that were rooted in the principles and insights I had found. I decided on furthering a concept I had worked on while brainstorming: an app that helps people meet other people. This might sound simple, but all you need in order to begin prototyping is a simple idea, the understanding that your idea might completely change, and a lot of passion. 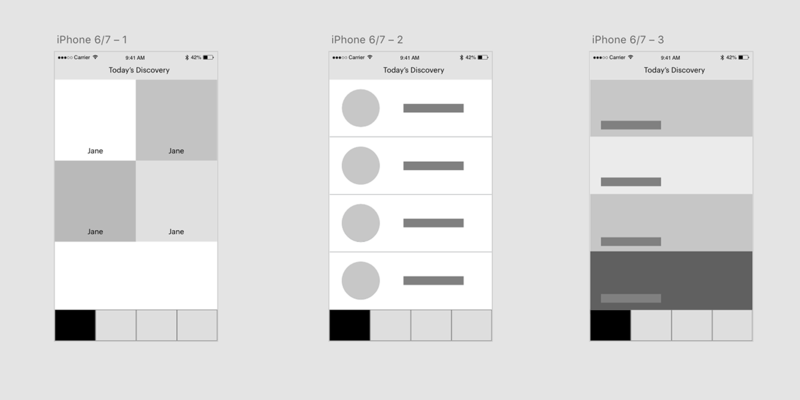 I began by drawing up super simple wireframes in Adobe XD, and turned those wireframes into higher and higher fidelity prototypes. While I’m working on my concept, I test my prototypes with people. This part- the prototyping with real people- should probably be bold and underlined. 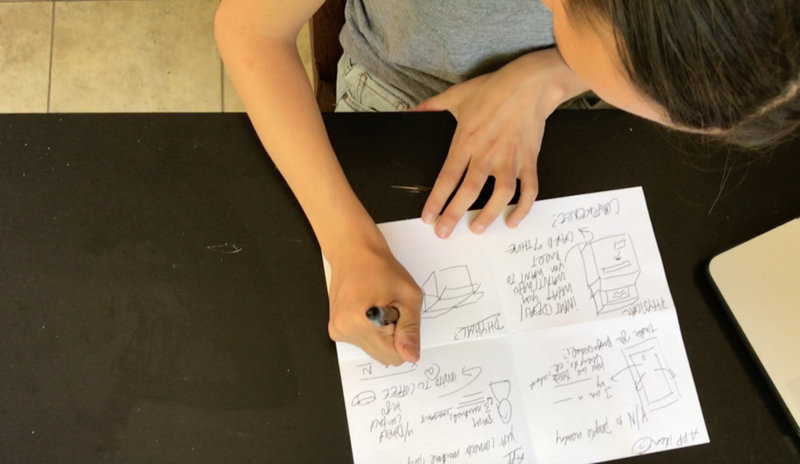 Testing design work is the foundation of my project and of all interaction design, as making things with people constantly critiquing, giving feedback, and interacting with your pieces by your side is crucial in making services human-centered. 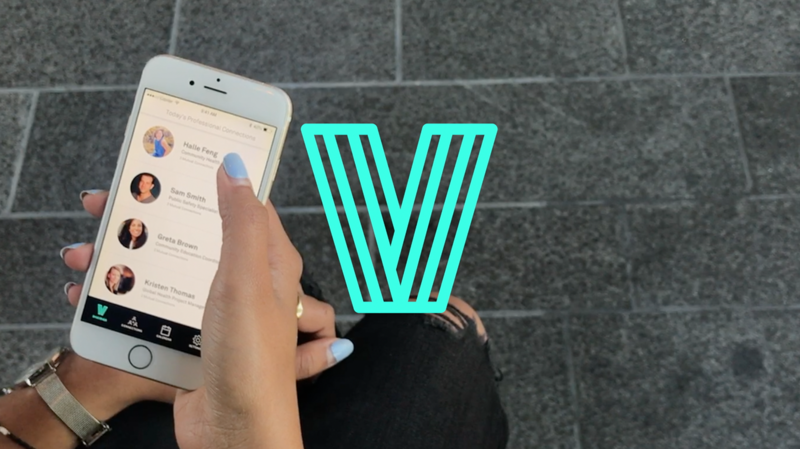 After all of my prototyping, I landed on my final piece: a networking app called Vit that allows you to connect and stay in touch with professionals in your area. In my research and prototyping, I found that more options does not always mean good options; in fact, I found that limiting how many people the user can connect with creates a sense of trustworthiness to those using the app. For that reason, within the app, people are given a set of four professionals they can reach out to per day- never more. These four professionals are chosen by Vit’s smart algorithm, which matches similar goals, interests, types of work, and more. You might be thinking: why four? In order to understand this, you have to know that a huge design icon in my life is Tristan Harris, an ex-Google design ethicist and creator of Time Well Spent. His entire mission is to make sure people spend their time online in a way that is meaningful and goal-oriented; something I strive to ensure in my own work. Giving the user only 4 people to reach out to per day not only makes them more likely to reach out to those professionals, but ensures they won’t spend more time on the app than is totally necessary. Users can reach out to professionals they are interested in connecting with, but only by setting up a time, date, and place to meet. In my research, I found that the most used part of LinkedIn was its people-finding and messaging services, but that often people were unsure how to go about actually meeting professionals in person. This is not dissimilar to general dissatisfaction with dating apps: while many dating services provide different ways to see who’s out there, the actual element of getting people to meet in person often falls flat. I also found that once people met professionals in person, the more likely they were to feel that these people were part of their larger professional network and could be called upon. Once they set a meeting, the professional on the other side of the app has 24 hours to respond to the invitation. After each meeting, the user can write a small note for their own viewing purposes about how it went, what the person was like, and attach that to the professional’s contact. They can then set more meetings with the professional, and have access to their actual email and contact info. Here’s the catch: users can’t see exactly where everyone works- they can only see their title, mutual connections, location, and information. This might seem strange, as the point of the app is to connect professionals and place of work seems crucial; however, the more research I did, the more I learned how the ‘superficiality’ of networking mostly comes from its goal oriented nature. Those that talk to professionals solely as a method for getting a job at their place of work come off as superficial and rarely create meaningful relationships; however, those that talk to professionals in their industry for the intention of meeting like-minded (or, in some cases, not-so-like-minded) individuals pursuing their own passions in their space were generally received as friendly and genuine. If you’re interested in seeing more of what I’m talking about, feel free to check out the video at the top of this page for a little summary. Overall, this project was a huge learning experience- learning to work alone, learning to own my process, learning what that process looks like. I'm looking forward to getting share more work with you all very soon. With this project coming to a close, I’m excited about what’s next: a few quick sprints, each spanning two weeks, where I’ll prototype and learn all I can about the ideas of generosity, reciprocity, giving, and receiving, eventually leading to a six-week long expansion on one of the sprints. Feel free to find that work on my medium account (https://medium.com/@natalielew) , and follow me on Twitter (twitter.com/natalierobinlew) and Instagram (@natrlew) for quick, timely updates!